Learning a language must result in becoming competent in a new culture because accessing the culture language stands for and being able to share its cultural content requires learning not just the meaning but also the historical and social background of its vocabulary. Words reveal the linguistic and social behavior of native speakers and give students a full understanding of the target language. 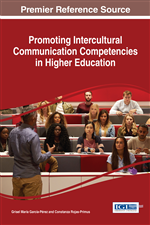 This chapter deals with different concerns present in foreign language classrooms, a space where language and intercultural competence must be developed. It describes some linguistic competence-related concerns (Section 1), then it deals with specific intercultural related aspects of grammar and perception which are part of the linguistic competence to be developed in class (Section 2) and it finishes with a general description of three basic ways used in the Spanish-as-second-language (SSL) classroom in order to teach language and culture so as to help students to develop intercultural competence (Section 3). Buendía et al. (2004) focuses on the process of social integration of immigrants and the intercultural competence they need to reconstruct their identity in a new country. Bourn (2011) deals with it from a point of view of the internationalization and effectiveness of graduates in a globalized world. Huber and Reynolds (2014) address it by offering an educational rationale for the development of intercultural competence in and through general education. In turn, second-language teachers have their own professional concerns regarding ways to help students to be linguistically proficient and culturally fit so they now see cultural knowledge and intercultural competence –recently referred to by several researchers in the ELT field as intercultural communicative competence– as a must (Oliveras Vilaseca, 2000; Byram et al., 2001; Alptekin, 2002; Kubota, 2004; Honna, 2005; Byram, 2009; Álvarez González, 2010; Nikleva, 2012). They relate and interact with Mexicans and Mexican Institutions. They are sent to Mexico by their companies to take job positions, or simply because. The professional performance of CEPE instructors indicates that they fit into the image of the liberal multiculturalism studied by Kubota (as cited in Norton & Toohey, 2004) since they impart information about cultural values, customs and way of life of Mexicans and compare them among the ethnic groups present in class; instructors seem to appreciate cultural differences and values and support the idea that all people are equal so they promote mutual tolerance, acceptance and respect.